I love roasted chicken, and I especially love that it’s cheaper to buy a rotisserie chicken at the grocery than it is to buy a raw chicken and roast it yourself in the oven. Whole uncooked chicken is getting more expensive to buy – it can be up to $8 dollars or more at my local grocery store, but a rotisserie chicken is only around $5 or $6. I always opt for saving money when it comes to food, because I’d prefer to spend the savings on traveling. Since I’m single, I am usually cooking for one; sometimes two, if my roomate, Nicole hasn’t eaten. Sandwiches are often an easy and simple meal that I can whip up quickly. I’m not a huge fan of sandwiches, but when they are well-made, I will gobble them up. Correction – I will inhale them. 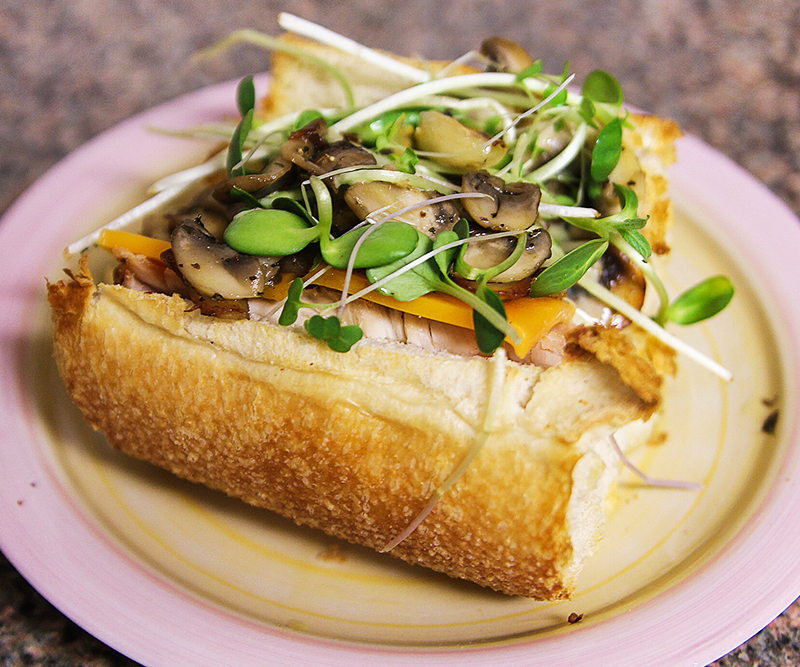 Tonight, I made the most fabulous sandwich ever, using leftover roast chicken. It was so, so good. I toasted sourdough bread with the roast chicken until the bread was crispy and brown to my liking. Meanwhile, I sautéed whole cloves of garlic and sliced organic mushrooms in butter with a little, salt, pepper and herbs de provence. 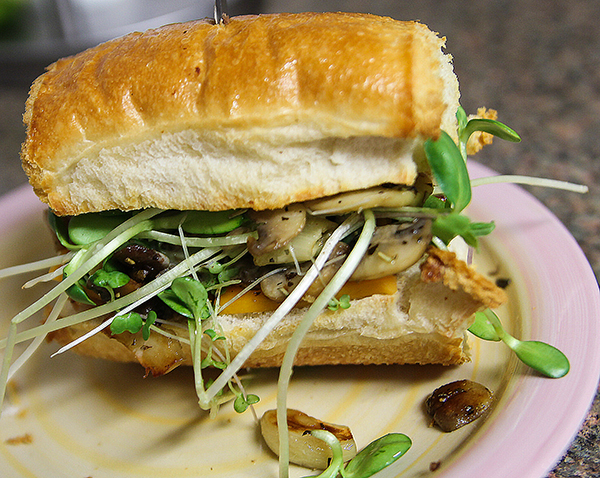 Add a slice of cheddar cheese, some fresh microgreens, and honey mustard salad dressing on top, and you have yourself the most fabulous sandwich ever made. It was so good that I am making myself hungry again. My favorite painnni to make is a good deli roast beef with mustrooms, roasted red peppers, swiss cheese and spicy mustard on a nutty whole wheat bread. Yum!! But yours looked great too. I will have to try subbing blue cheese!